Women In Retail Leadership Circle | Is it Dec. 26 Yet? Is it Dec. 26 Yet? The holiday sprint has begun! As retailers (and let’s face it, consumers), Thanksgiving Day to Christmas Day can be somewhat of a blur. Christmas shopping; end-of-fourth-quarter meetings; first-quarter planning; company Christmas parties; holiday events at our kids’ schools; baking Christmas cookies; dealing with family members; holiday drinks with friends; etc. Whew! 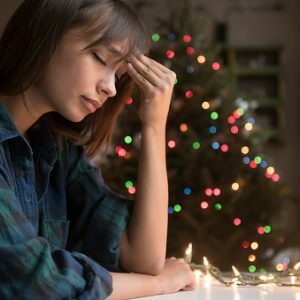 All of this activity can cause even the most organized, sane person to have a holiday hangover. Forget perfection. The holidays don’t have to be perfect or the same as last year. Don’t sweat it. Instead, focus your energy on enjoying the time spent with loved ones. Reach out. If you feel overwhelmed, ask for help. What’s more, helping others and volunteering your time is always a good way to lift your spirits as well. Plan ahead. Set aside specific days for shopping, baking, visiting friends and other holiday rituals. Learn to say no. Saying yes when you should say no can leave you feeling resentful and overwhelmed. Friends and family will understand if you cannot join in for every party or gathering. Take care of yourself. Prioritize your needs and feelings. Spending just 15 minutes alone without distractions can reduce stress and clear your mind. How do you de-stress this time of year? Please send me any tips or tricks at mcampanelli@napco.com. I’d love to share them with our readers! As you may have noticed, we’ve been posting quite a few job opportunities in the Inner Circle recently. Why? Because our readers and Women in Retail Leadership Circle members understand that posting job opportunities in our weekly e-newsletter offers them access to a group of highly engaged and exceptionally talented leaders in the retail space. We’d like to keep up the momentum! If you have an open position at your company, feel free to send the job description along with contact information to me at mcampanelli@napco.com, and we’ll post it here and on our members-only forum. Susan Wozniak, Business Strategy Analyst, Project Manager, Devils Backbone Brewing Co.
A Year of Accomplishments for WIRLC Members! Getting to Know Shelley Broader, Chico’s New CEO and President It’s Your Last Chance Ladies! Girl Talks East is Next Week! Good Morning!